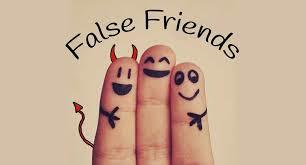 What is a false friend? False friends are two words in different languages – for example, English and Spanish – which writing or sound are alike, but they mean completely different. In Spanish, when you want to say that you are embarrassed, you might be inclined to say "Estoy embarazada". This is the first impulse. However, what you're actually saying is that you are pregnant.